This recipe is one I’ve put off posting for a long time. I think my reluctance has to do with the fact that this is such a simple recipe; I’m worried everyone will make it, realize how easy it is, and stop complimenting me when I serve it (at one of my Men’s Writing Brunches, for instance). Anyway, here it is, with a few food-inspired writing prompts to go with it. Sauté diced onion with 2 teaspoons olive oil until slightly soft, not quite translucent. Add to a large bowl. Set aside. In the same pan, sauté sliced mushrooms until they begin to shrink and soften, adding more olive oil if necessary. Add mushrooms to large bowl with onions, add artichoke hearts, wilted spinach, and mix together. Pour in beaten eggs, and mix in cheese. Pour into a buttered 13 x 9 rectangular baking dish and bake until the top and edges are slightly brown and set, about 35 minutes. 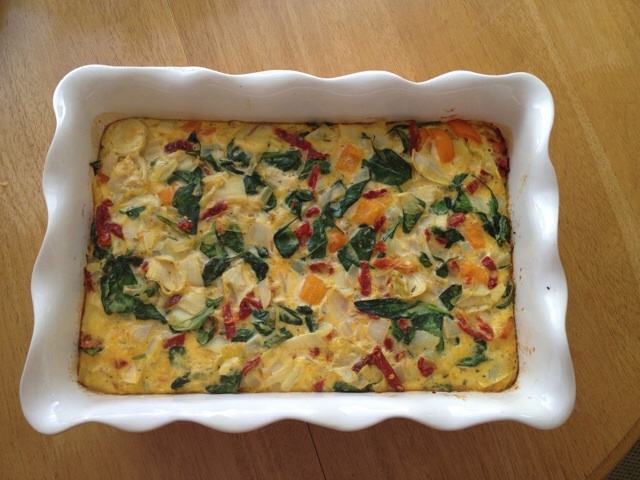 The frittata will appear to be too soft to slice while still hot, so allow to cool. Slice into generous squares, and serve at room temperature. Note: There’s really no way to mess this up, and you can add any ingredients you like, including cooked bacon, sausage, sun-dried tomatoes, shallots, bell peppers, and any variation of cheeses. Just make sure to sauté the vegetables first, until slightly soft. They will continue to cook and soften in the oven. Christopher, I enjoy reading about your creative adventures. I will be trying the healthy fritata. I’m a volunteer with Susan Turk FYI.